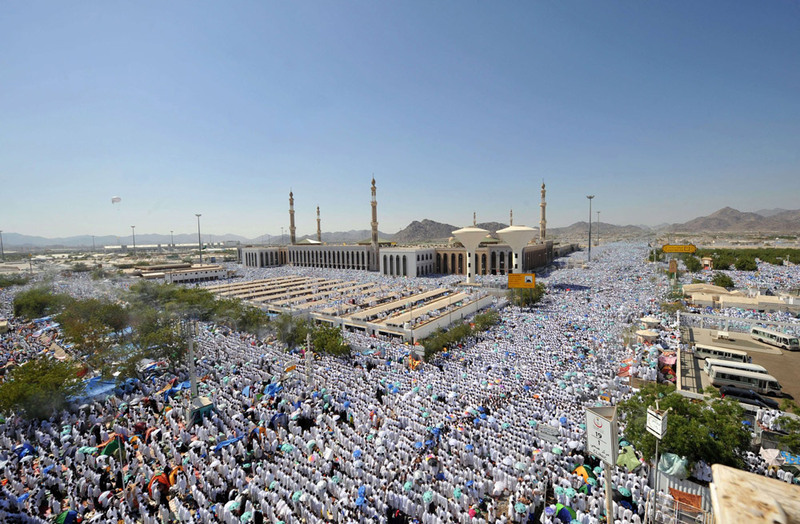 On average, two million people from around the world perform Hajj each year. 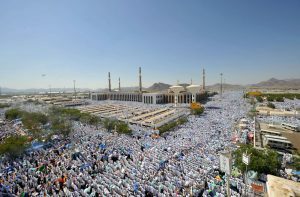 Statistics show that in 2012 (1433 AH), a record number of pilgrims performed Hajj, with the figure in excess of three million. 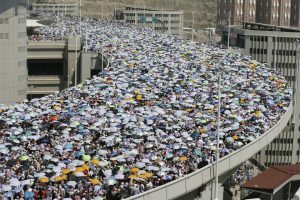 The actual number of pilgrims is thought to be much higher, due to the number of unregistered pilgrims that take part in the Hajj. In order to deal with the immense crowds, you will need to be mentally prepared and have a great deal of patience. 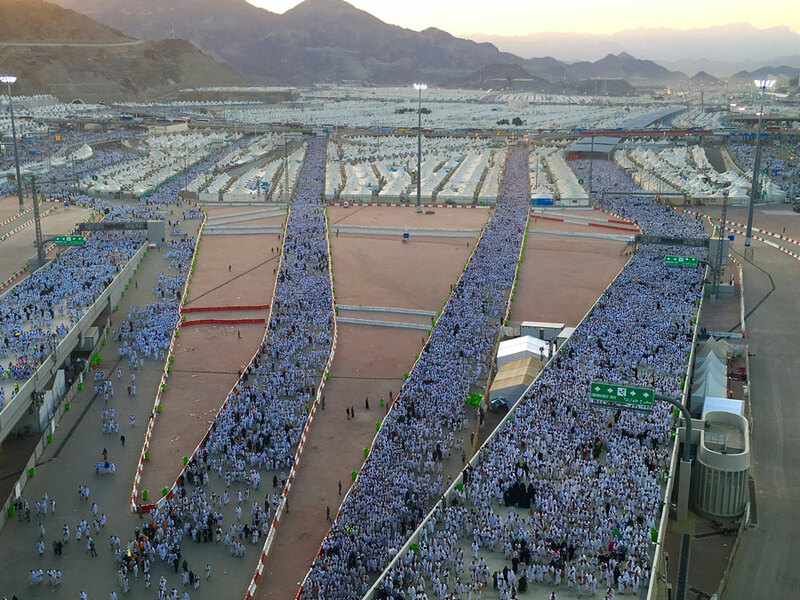 There have been a number of fatal incidents over the years due to stampedes as a result of panic in crowded areas, the most recent being in 2015 where over 2,000 pilgrims were killed in Mina. Avoid peak times – Some Hajj rituals, such as the pelting of the Jamarat, can be performed throughout the day. It is advisable to complete these rituals at times when there isn’t as much of a crowd as there normally would be during peak times. Take a break – If you’re performing a ritual such as Tawaf or Sa’i or walking between Hajj sites and you feel the crowd is getting too much for you, it is perfectly acceptable to take a break and find a less crowded area. Be aware – Just as you would if you were driving a car, be completely mindful of what’s going on around you. You may well collide with people or even wheelchairs during rituals if you’re not as careful as you should be. Take care of your belongings – Thieves tend to steal wallets and other items from pilgrims in crowded areas. Stay vigilant and ensure your belongings are adequately secure. Never push – In crowded places, some pushing and shoving is inevitable. Remember there will be many pilgrims from countries where pushing and shoving in crowded places is a norm. Try your best not to push and perform your rites in a cool and collected manner. Don’t harm anybody and remain calm if others are pushing. Go with the flow – In a crowd, go with the flow rather than against the flow, remaining within the block of people heading in the direction that you wish to go. Avoid walking in the opposing direction of people as this will inevitably lead to collisions. Company – Avoid walking alone, particularly if you’re a woman. It’s nice to have that bit of support, especially if you’re someone that struggles with crowds. Help others – If you notice someone around you becoming anxious about the crowds, try to give them space and reassure them. Be patient – Crowding and long queues are inevitable, so you must remain patient and try not to get frustrated. 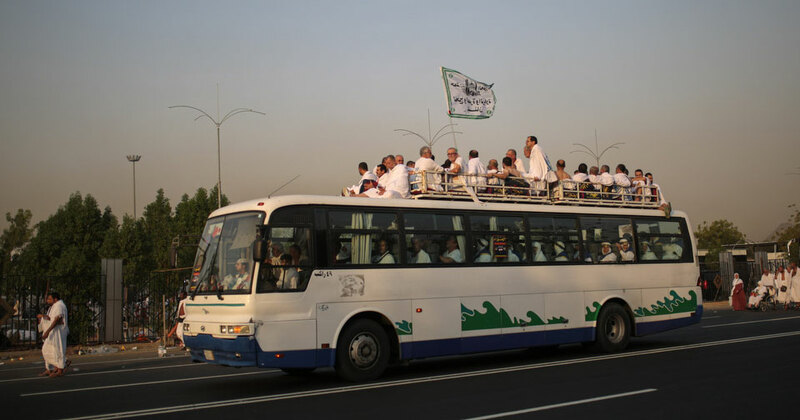 During the days of Hajj, most pilgrims are transported between sites via government (Mutawwif) appointed buses. The cost for your transport is normally included as part of your Hajj package, unless you choose to use a taxi. Some groups are provided with private buses. The various trips from one place to the next can vary greatly in terms of duration for a journey of the same distance, depending on your location, the time you leave and the amount of traffic on the road. It is important to remain patient as delays with transport are very likely. It may sometimes take less time to walk to the next site, which pilgrims often choose to do instead of taking the bus. On the 10th of Dhul Hijjah, government buses won’t be available to transport you to and from Makkah to perform Tawaf al-Ziyarah due to the fact that pilgrims will be performing the various rituals at different points in the day. Therefore, arrangements for your transport will have to be made with a private bus or a taxi. Please bear in mind that the above distances and times are approximations and may vary due to the location of your tent, whether you have any women, elderly or infirm pilgrims with you and the crowds present. Although you shouldn’t walk between each site and take the bus whenever possible, there will still be a significant amount of walking involved. There may also be a fair distance from your bus to your accommodation, depending on how close the bus can get to your tent. You may find that buses may not be able to get anywhere near your tent as a result of crowding and congestion, leaving you no other option than to walk. If you elect to conduct your entire Hajj by foot, keep in mind the distances and time it would take to walk between each site. On the 10th of Dhul Hijjah for instance, distances between sites will amount to at least 20 kilometres, which would take at least four hours to traverse. You are physically prepared and are able to manage the walking, ensuring it won’t affect other aspects of your Hajj. You know your way between each site or you have a guide that does. You stay close to your group, ensuring you don’t get separated from them. You are accompanied by your husband / Mahram if you’re a woman. There are a series of pedestrian tunnels between some of the sites, for example between Makkah and Mina, which makes the journey easier as they provide a direct route and shade from the sun, although it can still get hot. Refreshments, toilet and washing facilities, benches to rest on and medical facilities are also normally provided at regular intervals between sites. 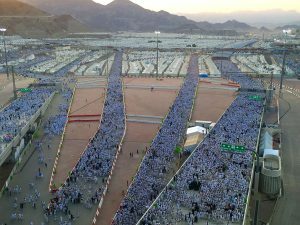 Pilgrims in Mina and Arafat are divided into groups and their accommodation is pre-allocated according to the country they’re from. Streets and camps are numbered, so learn your camp number or note it down somewhere. Men and women normally stay in separate tents. Before 2000, tents in Mina were small and basic. 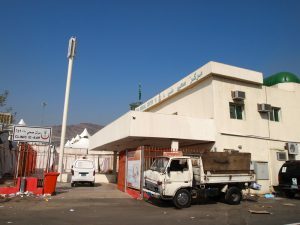 However, after a major fire in Mina in 1997 which took the lives of over 200 pilgrims and injured many more, they were replaced with fireproof tents which have air-conditioning, electricity, lights and electric plugs. 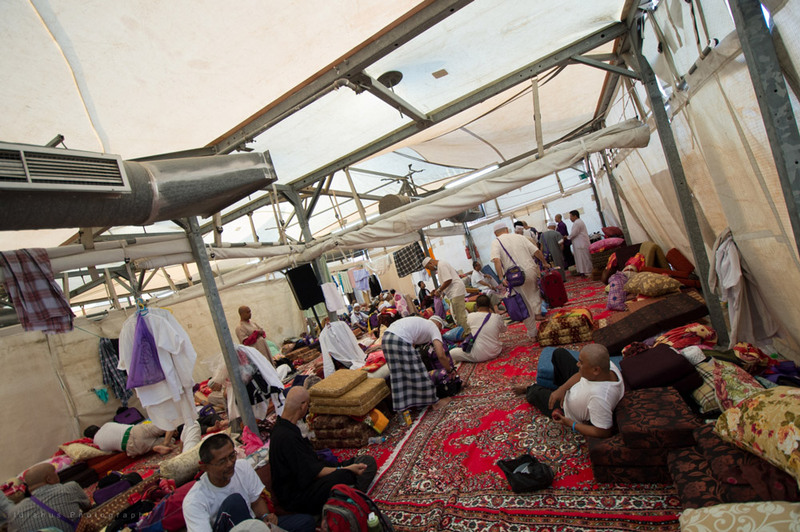 The tents in Arafat are usually large and wide. Some tents have air coolers (which use evaporation of water for cooling the air) and fans, whilst other tents don’t have anything of the sort. 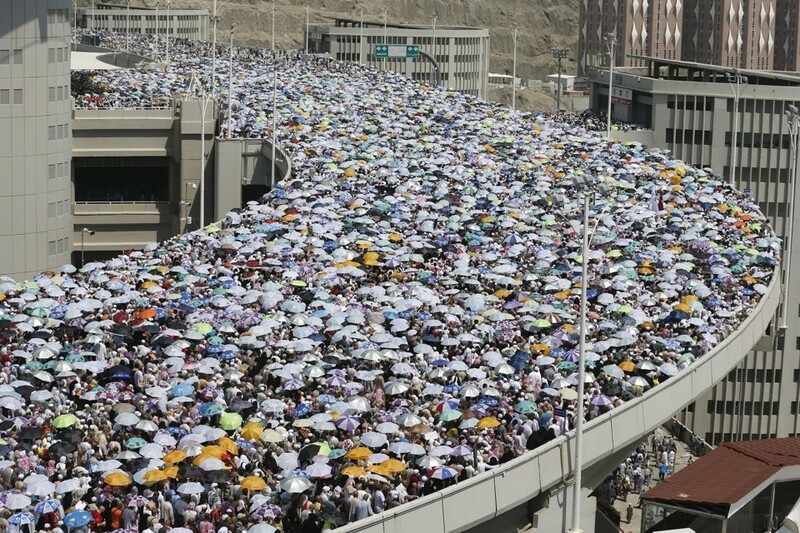 It would, therefore, be a good idea to bring a portable cooling device as the day of Arafat can get extremely hot. The comfortability of your tent really depends on your Hajj package. We have seen some tents which are extremely busy and cramped, so it’s best to contact your agent if you have questions or concerns regarding your accommodation in Mina or Arafat. If you have a choice, don’t choose a tent near the toilets or a cooking area. Try to choose a tent near the middle or back of the camp because the entrances to camps are usually busy. If you are in a larger tent, choose a sleeping area closer to the back of the tent. 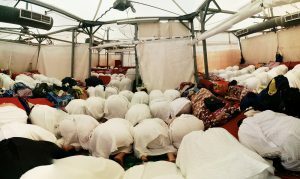 The front and middle areas of the tent are normally used for Salah, lectures and eating, so you will avoid having to constantly move your things around to accommodate for this, which can prove quite an inconvenience. As soon as you enter your tent, claim your position within the tent by throwing down your mat in your selected area and sitting down and laying on it. Avoid any confrontations or arguments for spaces in the tent. However, ensure you don’t take too much space. If you are performing Hajj with your spouse, you can choose the corner of the tent where you are both on either side of the partition. This allows for easier communication and sharing of food. Don’t spend too much time discussing worldly affairs in your tent. Don’t be too concerned about what is happening in other tents or which personalities are present in those tents. Attend lectures in other tents, if you feel they may be of benefit to you. In Muzdalifah, you will stay in an open area under the night sky. There are no tents or other accommodation facilities here. In Mina and Arafat, an inflatable air mattress or sleeping bag would be useful if you intend to take one with you. If not, a straw Hajji mat can be purchased and used to sleep on. 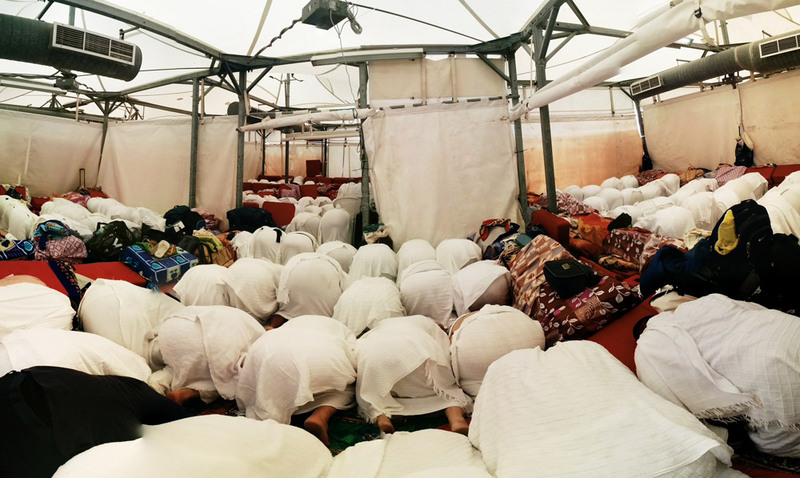 Some of the tents in Mina and Arafat are also strewn with carpets which can be used for rest. You will notice many pilgrims sleeping in all sorts of places – on the streets, under bridges, in the tunnels and even on top of the mountains. 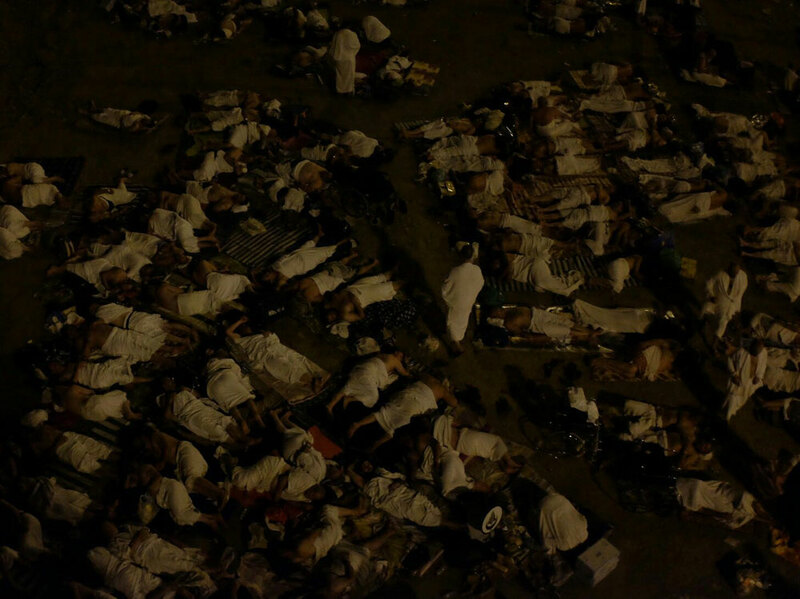 In Muzdalifah, finding a space to sleep can initially prove quite troublesome due to the sheer number of people. When you do find a space, make sure it’s with your group. If you take a sleeping bag, the night in Muzdalifah would be the ideal time to use it. If not, you should be able to buy a cheap mat, inflatable pillow and a blanket. Hajj packages normally provide food for the days of Hajj, although you may have to pay a little extra if it wasn’t included in your original package. You will need to check with your agent on the type of food that will be provided; meals can both be pre-packed and come in a box, or they may be cooked and served directly to you. The time at which these meals are served can also vary, so be prepared to eat at irregular times. There are a number of shops to buy food from in Mina, although the price of everything doubles during the Hajj period so be prepared to pay extra. There are no food shops in Arafat and Muzdalifah. It is a good idea to keep biscuits, dates, fruits and water with you. Ensure you drink plenty of water to keep hydrated as it can get very hot. It’s also advisable to keep some sweets to provide you with some energy when you need it. 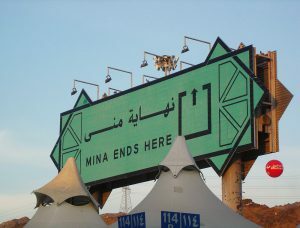 The boundaries for Mina are indicated by large green signposts. You must ensure you remain in the specified boundary of Mina during the 10th, 11th, 12th and possibly 13th of Dhul Hijjah. The boundaries for Arafat are indicated by large yellow sign posts and you must ensure you remain within this boundary during the 9th of Dhul Hijjah. The boundaries for Muzdalifah are indicated by large purple sign posts and you must ensure you remain within this boundary during the night of 9th of Dhul Hijjah. The main mosque in Mina is known as Masjid al-Khayf, located near the smallest Jamarah at the base of the mountain in the south of Mina. It is reported that the Prophet ﷺ, as well as 70 prophets that preceded him, performed Salah here. The main mosque in Arafat is known as Masjid al-Namirah. It is in this location that the Prophet ﷺ camped and delivered his sermon during his final Hajj. If you go inside this mosque, be aware that a sizeable portion of the front of the mosque is outside the boundary of Arafat. There are clear signs within the mosque indicating the boundary. There is also a mosque in Muzdalifah known as Mashar al-Haram, which is on the site of what used to be a small mountain. In the south of Mina, there is a hospital just opposite Masjid al-Khayf. There is an additional hospital near the old slaughterhouse. In Arafat, there is a hospital situated closely to Jabal al-Rahmah (the Mount of Mercy). There are also various mobile clinics in and around Mina, Arafat and Muzdalifah. All the camps in Mina and Arafat have shower and toilet facilities. The toilets have been combined with shower facilities, which provide water 24 hours a day. The majority of toilets in each row are squat toilets i.e. a “hole in the ground”, although there is at least one sitting toilet among each row. The toilet areas can get very busy so be prepared to wait a while for your turn. There are also Wudhu facilities available next to the toilet areas. Again, these facilities can get very crowded. Be early and avoid the crowds to take a shower or to perform Wudhu. Wake up at least one hour prior to Fajr in order to avoid the rush to use the washing facilities in the morning. Avoid the washing facilities about 20 minutes before Salah and immediately after having a meal. Use the washing facilities when people are eating, sleeping, or listening to lectures. Bring a suction hook to hang your Ihram when using the toilet / shower as there may not be any hooks in the cubicle. In Muzdalifah, toilet and washing facilities are available, but they will be crowded so patience must be exercised here. Sometimes, pilgrims are forced to use the bushes / mountains due to the long queues. It is for this reason that you are advised to use the toilet before you leave Arafat. 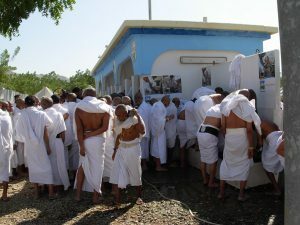 Public telephones are available in Mina and Arafat, but again, they can become very crowded. These public telephones use phone cards, which can be purchased in a variety of denominations ranging from 10 to 100 Riyals and above. You can also purchase a mobile phone card, with a minimum charge of 100 Riyals. Prayer items such as pocket Quran, Dua book, Dua list, Tasbeeh, prayer mat, compass for the Qibla and Hajj guide book. Waist or neck pouch for your valuables. Comfortable clothing and a pair of trainers / sneakers for when you’re out of Ihram. Toiletries. Remember, items must be fragrance-free when in Ihram. Suction hooks to hang your clothing when using the washing facilities in Mina and Arafat. Medication. Medical facilities are also provided during the days of Hajj should you need them. Snacks that won’t go off quickly, such as biscuits and sweets. These will be useful while travelling. Inflatable air mattress / sleeping bag. Inflatable pillow and light blanket. Pebble bag or bottle to put your pebbles in for Rami. Ear plugs and eye mask. Foldable travel Wudhu and Istinja jugs. ID card for Mina and Arafat. This card shows the location of your camp in Mina and Arafat. Mobile phone and charger. Top your phone up before you leave for Mina if you don’t have much credit left. You can view our full checklist for the entire journey here. When a mistake is made during Hajj or Umrah, Fidyah (expiation) is required to atone for the mistake. By offering Fidyah, you are making amends for shortcomings during Hajj or Umrah.